The practicalities of Doyle and Thackeray’s working relationship are well known: the writer and artist were close friends who had worked together on Punch in the forties, and continued to support each other throughout their working lives. This was sometimes a matter of mutual praise; Thackeray declared ‘Dear old’ Doyle (Letters, III., p.155) the natural heir of George Cruikshank, and Doyle used an expression from Vanity Fair (1847), which refers to the fictitious Brown, Jones and Robinson, the bumbling everymen of their day, as the basis for the roaming idiots in his comic picture-book, The Foreign Tour (1854). Their relationship, though, was asymmetrical. Thackeray enjoyed Doyle’s witty company and the artist flattered his companion by depicting him in caricature (Engen, pp. 62–3); but Doyle benefitted in the economic sense of the term from the author’s offers of employment which were given, it should be noted, only when the writer was indisposed and could not illustrate his books for himself. According to Rodney Engen, the artist was engaged to illustrate Rebecca and Rowena when Thackeray was too ill to draw (p.74), and it is well-known that he commissioned The Newcomes designs because his friend, having resigned from Punch over its anti-Catholic stance in 1850, was short of ‘tin’ (money). As John Olmsted explains, ‘Thackeray’s decision to recommend Richard Doyle as illustrator for The Newcomes was prompted more by an impulsive gesture of charity than by any real desire to enter into a collaboration’ (93). Thinking that the essential compatibility of their shared interest in social observation and satirical humour might be enough to create a productive partnership, Thackeray was soon disabused of the wisdom of commissioning his friend. Doyle certainly shared Thackeray’s dry and ironic wit, but The Newcomes was beset with difficulties almost from the outset, These problems were both professional and artistic, and can be seen from the perspectives of both participants. The most pressing issue, as Viola Hopkins Winner explains, was Doyle’s inability to meet deadlines. 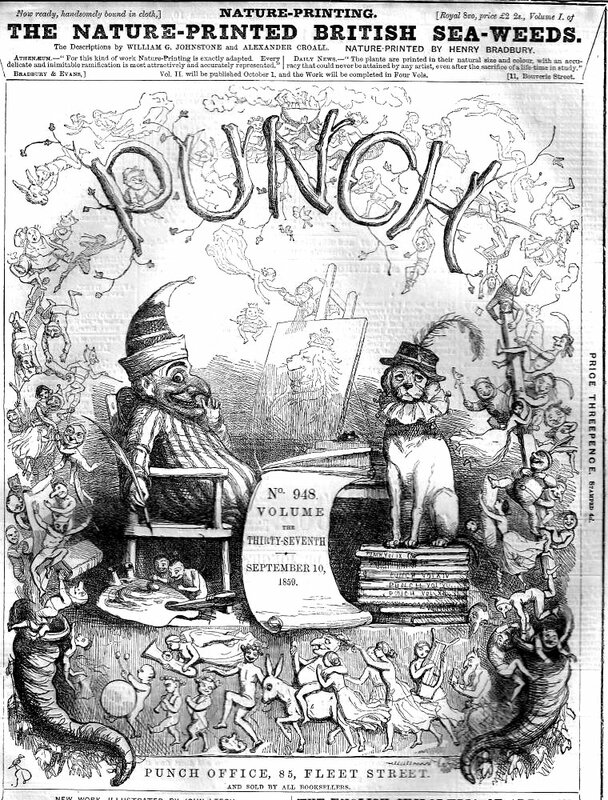 Doyle had faithfully worked to strict schedules during his time at Punch (1843–50), but he struggled with the discipline of creating the full-page etchings and wood-block initials for Thackeray’s novel (23 parts, October 1853– August 1855). Issued in monthly serial parts, the text had to be completed in a two-week period in readiness its printing and binding, as a small pamphlet, in the famous yellow wrappers, and the artist, who had to produce at least two etchings and about six small cuts, was constantly behind. Doyle infamously irritated the Dalziels with his endless procrastination — once claiming he was late with a project because he ‘had not got any pencils’ (p.58) – and he was equally recalcitrant in his dealings with Thackeray. The author’s exasperation with Doyle is preserved in his correspondence, which starts unenthusiastically with a letter to the publishers Bradbury and Evans tentatively agreeing on the commission (1 September 1853, Letters, III, p.300) and is followed almost immediately (on 6 September) with an expression of doubt: ‘I feel’, he tells a friend, ‘almost sorry’ that he will not be doing the illustrations, even if ‘it is a great weight off my mind’ (Letters, III, p.302). Yet the anticipated relief was cancelled by Doyle’s first attempts at illustrating the novel; by the end of October 1853 and at the end of the period of preparation, his illustrations for instalment one were delivered and found to be inadequate, ‘not so good’, Thackeray laments, as his own (Letters, III, p.305). Thereafter the author had to contend with Doyle’s characteristic blend of tardiness and, as far as the writer was concerned, a wait unjustified by the quality of the work. Though later known as a chaotic editor of The Cornhill Magazine and barely one to complain about observing procedure – most of his dealings with his publishers being in a state of disarray – Thackeray’s response to Doyle’s behaviour is reasonable. The risks he posed to the book’s commercial success and artistic integrity were tangible, and the author believed the whole project would be in jeopardy if he failed to take action. On the face of it there is a clear apportion of blame, and critics writing on the subject have always examined the relationship from Thackeray’s point of view. However, it is possible to view the situation from Doyle’s perspective. Nothing can justify his near-ruin of The Newcomes’ schedule, but analysis of the work has failed to consider the context in which the artist and writer were operating. Part of the problem probably lay in the artist’s unfamiliarity with the production of etchings; essentially a ‘draughtsman on wood’, he seems to have struggled with the technical requirements of this type of design; notably, Thackeray’s complaints were mainly directed at the ‘big cuts’. Another part of the difficulty probably lay in the writer's attempts at managing his collaborator. In particular, it can be argued that Thackeray undermined his partner by denying him full autonomy. Thackeray was bound, it seems, by the idea that illustrators were the servants of the authors, a notion exemplified by Dickens’s treatment of Phiz and Charles Reade’s manipulation of all of his putative collaborators. This arrangement was changing, however, by the mid-fifties. Although the Pre-Raphaelites’ illustrations did not appear until the publication of William Allingham’s Music Master in 1855 and the ‘Moxon Tennyson’ in 1857, it was widely assumed that the interdependence of visual and verbal texts necessarily implied a professional equivalence between the two participants in the making of their hybrid work, and Doyle may have felt that illustrating The Newcomes as the author’s artistic inferior was incompatible with his status as the self-motivated interpreter of texts such as Mark Lemon’s The Enchanted Doll (1849) and Ruskin’s The King of the Golden River (1851). Both of these were illustrated without authorial interference and derived almost all of their success from his quirky designs. Olmsted notes how Thackeray enlisted Doyle’s help out of ‘charity’ (p.93), and although the artist never revealed his attitude to the commission and remained on good terms with Thackeray until the end of the writer’s life, it is not impossible, in short, that he felt patronised and under-valued. Being given work on the basis of ‘charity’ is barely designed to produce the most spirited response, and the source of the difficulties should probably be divided, it seems to me, between an artist demotivated by the circumstances and an overbearing novelist. As so often in the development of the Victorian illustrated text, the temperaments and relationship of the participants were at least as important as the nature of the visual and verbal texts and the possible interactions between them. Allingham, William. The Music Master. Illustrated by Rossetti, Millais and Hughes. London: Routledge, 1855. The Cornhill Magazine. London: Smith Elder, 1860–64. [Doyle, Richard]. Foreign Tour of Messrs. Brown, Jones and Robinson, The. London: Bradbury & Evans, 1854. [Doyle, Richard]. Manners and Customs of Ye Englyshe. Text by Perceval Leigh.London: Bradbury & Evans . Lemon, Mark. The Enchanted Doll. London: Bradbury & Evans, 1849. Punch. London: Bradbury & Evans, 1843–50. Ruskin, J. The King of the Golden River. Illustrated by Richard Doyle. London: Smith Elder, 1851. [Thackeray, W. M.]. The Letters and Private Papers of W. M. Thackeray. Ed. Gordon Ray. 4 Vols. London: Oxford University Press, 1945–6. Thackeray, W. M. The Newcomes: Memoirs of a Most Respectable Family. With illustrations on steel and wood by Richard Doyle. London: Bradbury & Evans, 1854–55. First published in 23 monthly serial parts, October 1853–August 1855. Note: the original parts in wrappers are extremely rare; however, the first book editions of the novel are extremely common. 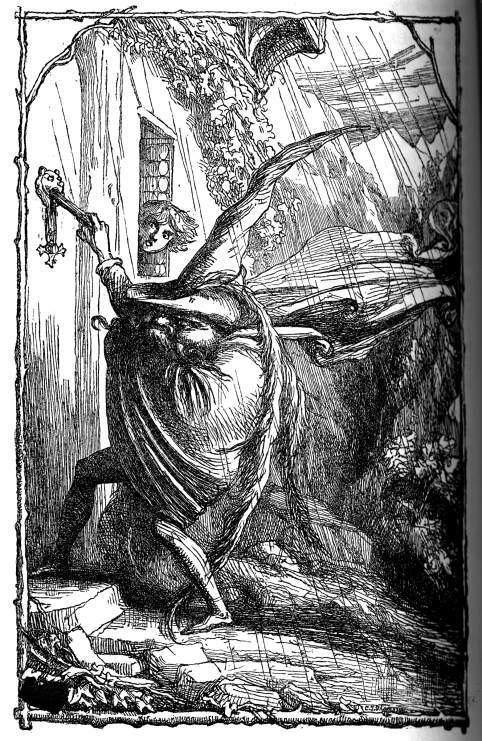 The book was reprinted in the 1860s and in subsequent editions; Doyle’s illustrations were retained. Thackeray, W. M. Pendennis. Illustrations wood and steel by Thackeray. London: Bradbury & Evans, 1849–50. The novel was first published in parts, 1849–50. Thackeray, W. M. Philip. Illustrations on wood by Thackeray and Walker. First published in The Cornhill Magazine, January 1861–August 1862. London: Smith Elder, 1861–2. Note: The first book edition was published by Smith Elder in 3 volumes in 1862, but without the illustrations. Subsequent editions restored Walker’s contributions. Thackeray, W. M. Vanity Fair. Illustrations on steel and wood by Thackeray, London: Bradbury & Evans, 1848. The novel was first published in parts, 1847–8. Thackeray, W. M. The Virgininians. Illustrations on steel and wood by Thackeray. London: Bradbury & Evans, 1858–9. The novel was first published in parts, 1858–9. Titmarsh, M.A. [W.M. Thackeray]. The Kickleburys on the Rhine. Written and illustrated by Thackeray. London: Smith, Elder, 1850. Titmarsh, M.A. [W.M. Thackeray]. Mrs Perkins's Ball.. Written and illustrated by Thackeray. London: Chapman & Hall, 1847. Titmarsh, M. A. [W. M. Thackeray]. Rebecca and Rowena. London: Chapman & Hall, 1850. Titmarsh, M.A. [W.M. Thackeray]. The Rose and the Ring. Written and illustrated by Thackeray. London: Smith, Elder, 1855. Burton, Anthony. ‘Thackeray’s Collaboration with Cruikshank, Doyle and Walker.’ Costerus n.s 2 (1974): 141–184. Canham, Stephen. ‘Art and the Illustrations of Vanity Fair and The Newcomes.’ Modern Language Quarterly 43:1 (1982): 43–66. [Dalziel]. The Brothers Dalziel, A Record of Work, 1840-1890. Foreword by Graham Reynolds. 1901; reprinted London: Batsford, 1978. Fisher, Judith. ‘Image versus Text in the Illustrated Novels of William Makepeace Thackeray.’ Victorian Literature and the Victorian Visual Imagination. Eds. Carol T. Christ and John O. Jordan. Berkeley: University of California Press, 1995. pp. 60–87. Hamerton, Philip Gilbert. Etching and Etchers. Boston: Little, Brown, & Co. 1908. Harvey, John. Victorian Novelists and Their Illustrators. London: Sidgwick & Jackson, 1970. Kennedy, Victor R. ‘Pictures as Metaphors in Thackeray Illustrated Novels.’ Metaphor and Symbolic Activity 9:2 (1994): 135–47. McMaster, Juliet. Thackeray: the Major Novels. Manchester: Manchester University Press, 1971. Olmsted, John C. ‘Richard Doyle’s Illustrations for The Newcomes.’ Studies in the Novel 13 (1978): 93–108. Ray, Gordon. The Illustrator and the Book in England from 1790 to 1914. New York: Pierpont Morgan Library, 1976. Schwab, Sandra Martina. ‘Richard Doyle’s Comic Histories: a Victorian Look at the Middle Ages.’ History and Humour: British and American Perspective. Eds. Barbara Korte & Doris Lechner. Bielfeld: Transcript, 2013. Stevens, Joan. ‘Thackeray’s Pictorial Capitals.’ Costerus n.s. 2 (1974): 114–40. Stevens, Joan. ‘Thackeray’s Vanity Fair.’ Review of English Literature 6 (1965): 19–38. Winner, Viola Hopkins. ‘Thackeray and Richard Doyle, the “Wayward Artist” of The Newcomes’. Harvard Library Bulletin 26 (1978): 193–211.